The Medieval Christian was a common target for the Church's visual propaganda machine. Contributors included famous artists and sculptors including: Michelangelo, Raphael, Leonardo, and Donatello (whose work, of course, lead to Master Splinter's naming of the Teenage Mutant Ninja Turtles. The Sistine Chapel , Michelangelo's masterpiece is an obvious example of propaganda. In order to effectively teach the Gospel to those who were by and large illiterate, the Church turned to works of art such as this one. The Creation of Man is depicted is this censored picture. The Last Judgment is obviously supposed to impart fear and awe into the viewer. 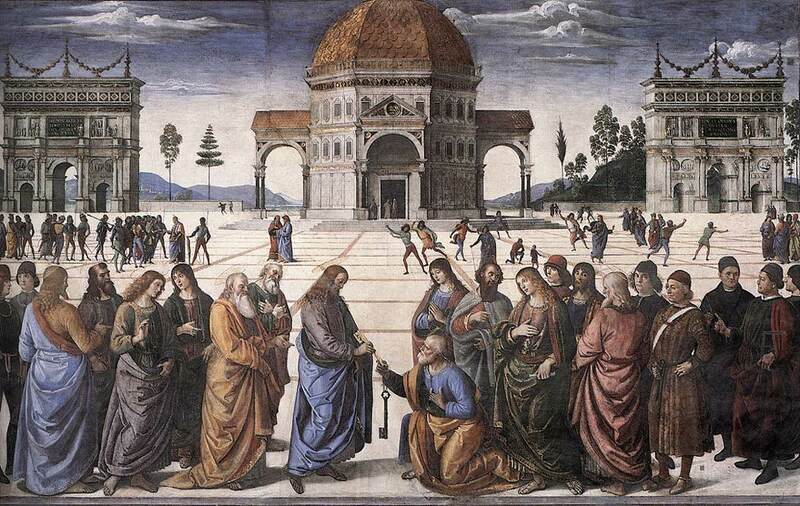 Another artist by the name of Perugino also played a part in the Sistine Chapel and painted the Consignment of the Keys which depicts Jesus giving His power over to Peter, and shows the crowds stoning Jesus in the background. 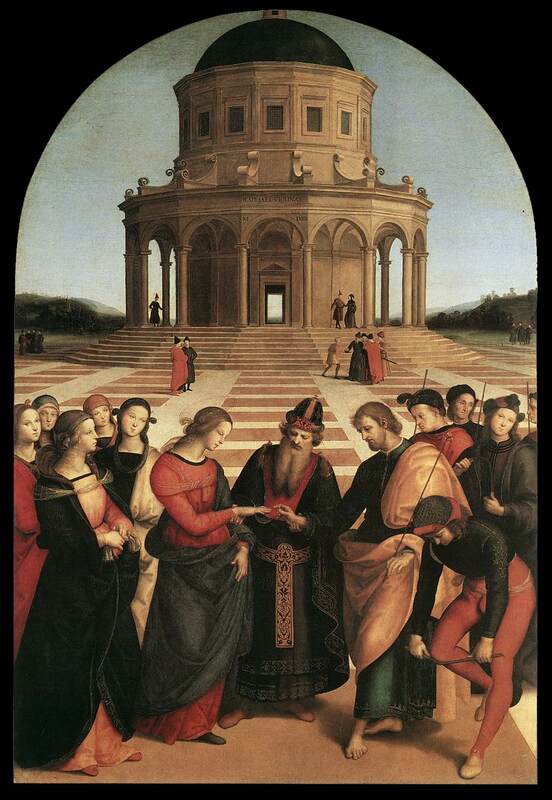 Raphael also played his part in teaching the Medieval Christian through art. His Marriage of the Virgin shows how God brought Joseph and Mary together by supernaturally making his staff bud. We see the Church's teaching in French painting, as well. 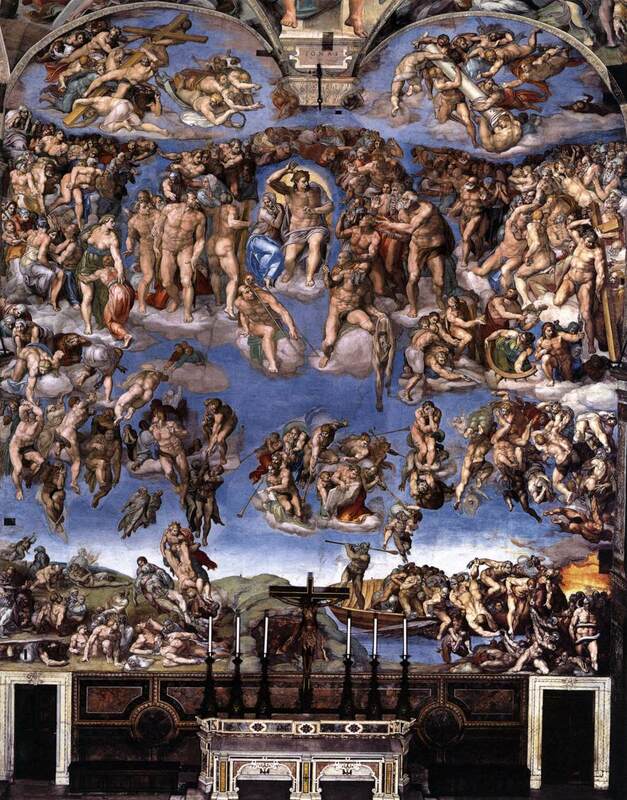 Here is a picture of the Last Judgment, showing the redeeming side of Jesus. This is The Epiphany by Giotto di Bondone which tells the story of the baby Jesus. Another form of art was plates. Pictured here is David and Goliath from the David Plates of the Second Cyprus Treasure which depicts the decapitation of Goliath and the protection God gave David over the giant. Another popular form of art was sculpture. Here is another depiction of David and Goliath's fight but shown from Donatello's sculptural perspective. 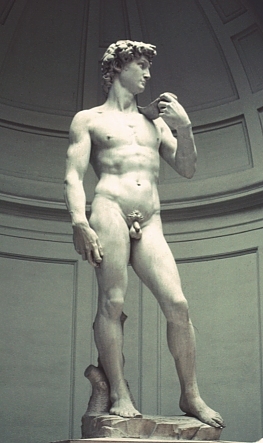 In the same vein, Michelangelo also created the probably more popular David. Finally, the Church would often use drama to teach their people. One such story is the pageant, "A Christ-taken prisoner." Punctuation, is used primarily as an aid to help one read out loud. This aid is and was especially useful in religious circles where readings in churches were a common practice. An interesting note, the Spanish language places an upside down question and exclamation mark before the sentence as well as at the end. This gives a reader fair warning of how he should properly enunciate and inflect. (Does anyone else remember how annoying it was to read some Shakespearean play in high school? People would read in a monotone the whole time, and then the narrator would read how they were supposed to have said it in a whisper or a rage). One example of medieval punctuation would be the punctus elevatus, which means, and yes, I will explain... 'One of the positurae which passed into the general repertory; used to indicate a major medial pause (after a colon, or membrum), where the sense is complete but the meaning is not' (Parkes 1992). Wow, what utter nonsense without some explanation, but that is coming. Some great examples of the punctus elevatus and other medieval punctuation can be found by clicking here. The punctus elevatus looks like an inverted semicolon, and was used in a very similar manner to our modern day comma or semicolon. The punctus (. or •) changed meanings depending on where it was located. If it was found in the middle of a sentence it acted like a semicolon; at the beginning like a comma, or at the end like a period. A punctus versus, which looks like the number seven placed over a period could also be used at the end of a sentence to indicate a final pause. The question mark, which is quite necessary to our modern day writing, wasn't invented until the seventeenth-century. Until then the punctus interrogativus was used. It is represented by a little squiggle or tilde. Finally, the virgula suspensiva was used in the same way as our comma, often in the middle of a line of poetry, but could be doubled and tripled for a longer pause. I'm gonna get medieval on your assonance! In reality, this entry has to do with dry rot like punctuation & spelling, but never fear because I intend to make it interesting and informative. Early into the Middle Ages, books were extremely rare. This was because they were usually printed on calf and lamb skin and the reproduction on books was a very expensive, time consuming, and crude one. That is, reproduction was crude in an undeveloped way. Books of this age were typically quite beautiful, the traditional way consisting of a number of specialized monks converging on one work and beautifying it in every aspect. Therefore, a reader in this time period was either a member of the religious community, well off, or very lucky. In today's world of course, any member of any class, especially in the developed world has access to a plethora of books. Even e-books or books online are available to anyone with a library membership. Correct spelling and punctuation were not high on the priority list back then as there was no real unifying authoritative work. Dr. Johnson's Dictionary, of course did a lot for punctuation, but unified spelling did not come about until Johann Gutenberg's printing press. In today's world, by contrast, correct spelling and punctuation is of the utmost importance. Documents containing errors are hard to take seriously and are usually the object of ridicule. For additional information; feel free to check out this page. John's brand spanking new blog!